Oh what fun we’re gonna have. Penny has shown me that she has the strength and desire to do the flat rides. Now, to test her resolve. Penny is not so great on pulling hills. We do conditioning on several trails with long hill pulls and she is not a fan of that. She gets slower and slower the longer we’re going uphill. Part of this is the muscles she’s using that she has never had to use before, so building up her back and loins for hill work is critical. The other part, I believe, is that she gives up in her head. If she’s working with Mooch (Ro’s new gelding) who can pull a mountain like no-one’s business, she will make every effort to stay right with him. When we work with Steel, or alone, she gets halfway up and she wants to stop. Let’s see how she works at OD on a Limited Distance ride. Now that I’ve tested her desire, let’s test her resolve to finish the ride. Naoma will be riding Steel. I think Naoma is going to die because she is not riding fit and OD is hard on the body. I hate to kill my own child, but she really really wants to compete this year. I am resigned to holding a funeral the day after. Mid-70’s. That’s right, mid 70’s, low humidity, and partly sunny with a breeze. Who would believe this was an OD weekend, right? My travel to OD was smooth sailing and quick. (What? No adventure?) I arrived in base camp a half an hour earlier than I expected. Partly because I had no troubles catching Penny and Steel and partly because I had no flat tires (remember the OD ride with the three blow outs?) I had asked Cindy earlier in the week if she wanted to tandem down there again, and she deftly side stepped my question. I don’t blame her. last time she tandemed with me it took us six and a half hours because I blew out all those tires on my trailer. Cindy did (however) hold a spot for me to camp right next to her, so I quickly backed into my spot and started unloading. 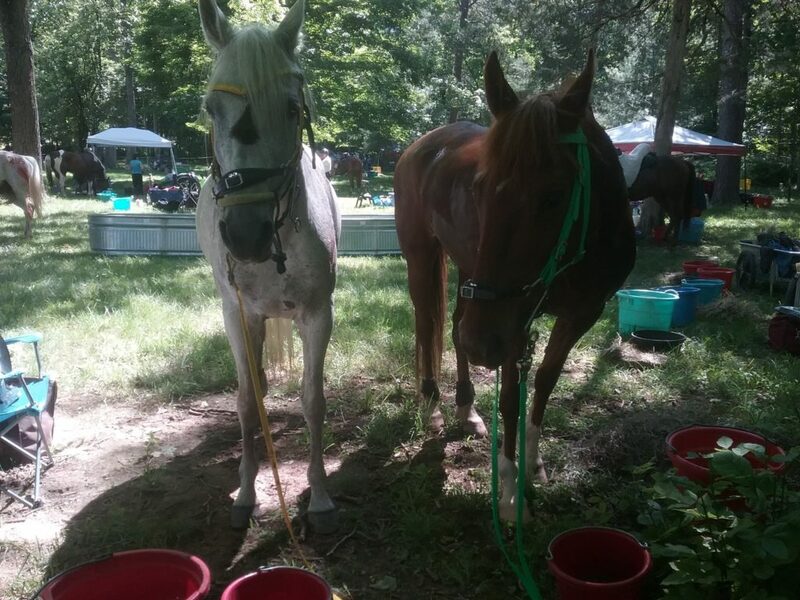 I had Penny and Steel tied long so they could eat grass while I was setting up their corrals. Halter in pieces. Cindy captured her and loaned me a halter while I dug one out of the trailer. Because Penny is such a big mare, and because we had a lot of room this year as the OD crew gave us larger parking areas, and because this is Penny’s second camping trip, I decided to put her in the corral alone and set Steel up in the electric tape (that has no electric … so I hope Steel is respectful anyway!) I am very very glad I chose this route because camping with Penny was very entertaining … and thankfully the corral panels held so we didn’t hear “LOOSE HORSE” in reference to Penny. First, she was still trying to get her shoes off. She’s been trying to get her shoes off from the minute we got home from Renee’s with them on. She stands and shakes her feet, kicks at the back, trying to dislodge whatever is hanging on there. It’s hysterical to watch from the pasture. Not so hysterical to watch while camping and the feet are milli-inches from the corral panels. Third, she was getting angry – like REALLY angry – and started rearing then slamming down with a huge buck. This went on for over an hour. Fourth, after she decided the airs above ground were not working, she started running in her corral. Literally, and from the picture you can see it isn’t all that big and she was cantering in a teeny circle. Of course, then Steel had HER moment. 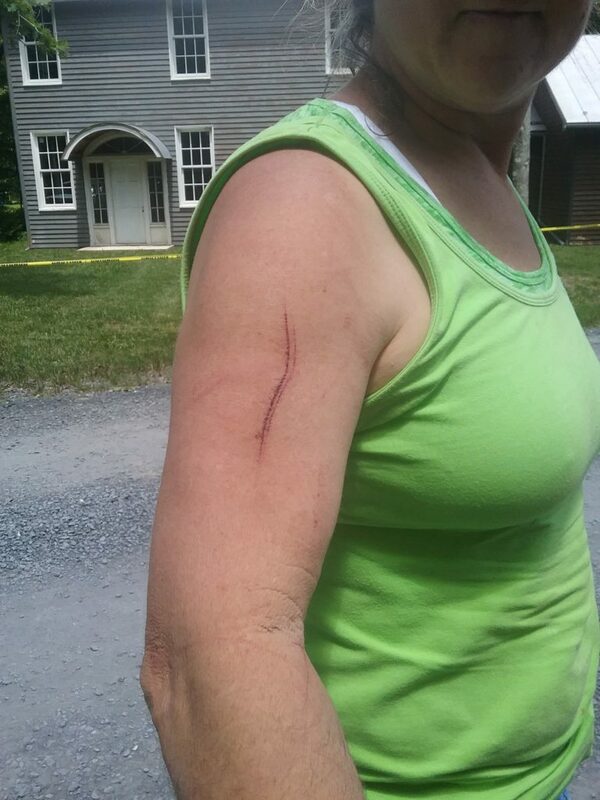 Dom came over to camp to talk to us and suddenly Steel was weaving and weaving in her pen. Dom moved up the hill, still within sight and hearing distance of Steel, and was visiting with some other riders and Steel was watching her, then weaving, then watching her and weaving. Typically Steel only starts weaving in the morning when she knows it’s time to get saddled. Only thing I could come up with was because Dom came over, and Steel could see and hear her, Steel thought it was time to get saddled and go riding. Steel was very respectful of her non-electrified pen, however, so she didn’t get into any trouble. 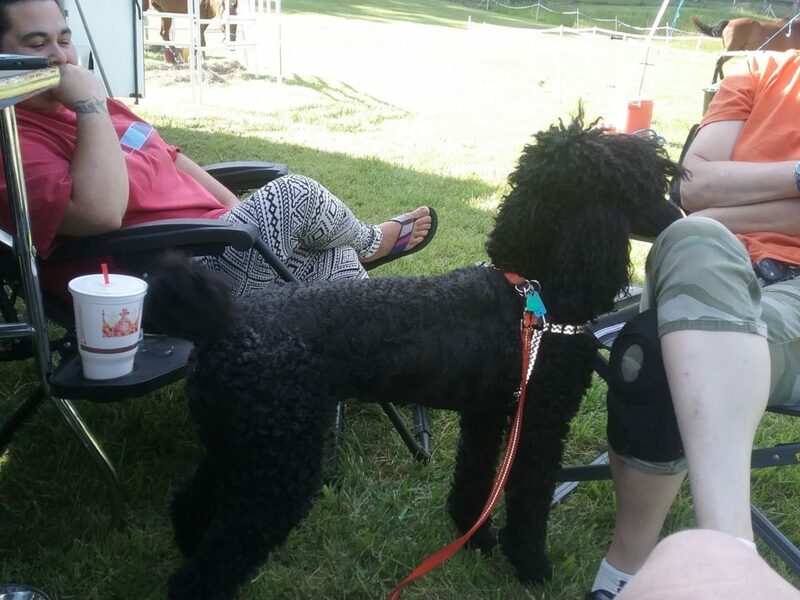 Poe was having a great time camping. Everyone kept stopping by our camp to see Poe. It was awesome to have so many people stopping by. Poe was in heaven getting petted and touched and being the center of attention. She went from one lap to the next, resting her head and waiting for that loving pat or rub to her fluffy top knot. Time for bed and Penny is still acting like a jerk. 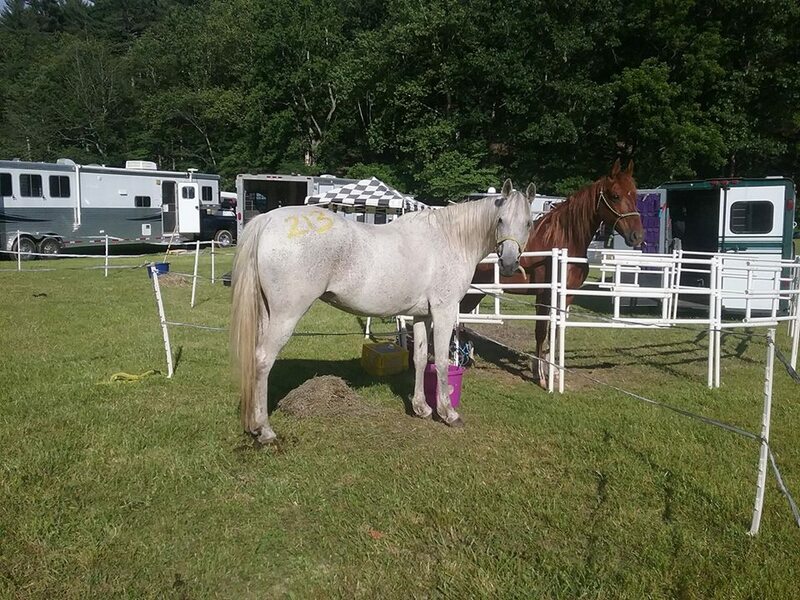 This is only her second camping trip and her first camping trips was in a kinda hap-hazard type set-up where she could only see a couple horses around her. At OD, it’s wide open flat field and she can see horses all the way from one end of the field to the other. As it started getting dark, she started doing her airs-above-ground again and I was certain there was going to be a catastrophe during the night. I chose to sleep with my door propped open, so I could hear it if it happened. I read for about one minute and then fell asleep. I woke up with a start, my bladder screaming for some relief, and Poe standing looking out the door. OH NO … is Penny loose? I look out the door and Penny is standing head down, resting. I clicked on my flashlight and Steel is laying down, quiet. Well, hell. What was that banging? Then I heard it again. Across the road from us, a horse was banging his pan. It was 4:30 am so I chose not to get up and relive my bladder. I figured it would wake me up in an hour so I wouldn’t need an alarm. No alarm needed as camp lit up like a circus with the loud speakers blaring revelry at 5:00 am. I lay there for awhile, afraid to get up because my bladder is REALLY cussing at me now. Poe is looking out the door and wagging her tail so I knew Cindy was out and about. Time to get up. 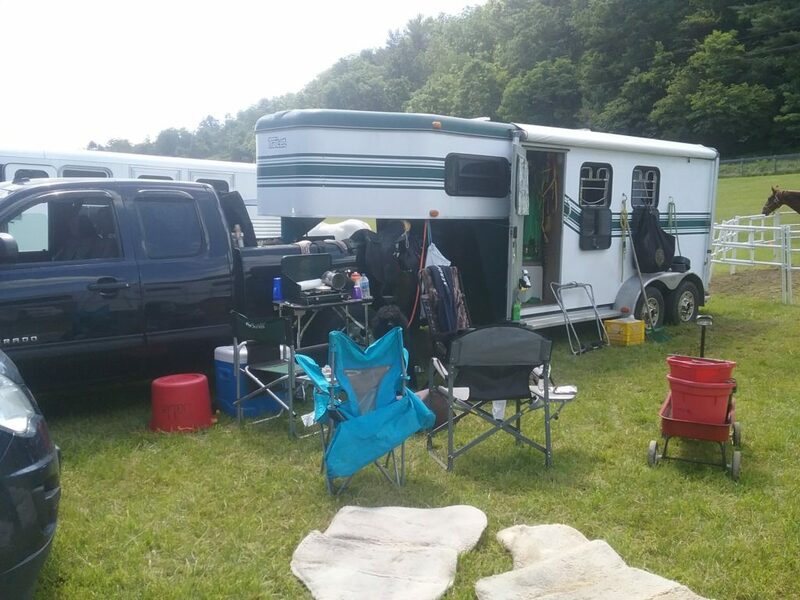 I know I am going to have to hold my two horses while the 50 milers start because we are camped right behind the starting line. This was not a really good place to be camped at OD. That little platform gets a ruckus going! And it was a good thing we did hold onto those two girls because when the 50’s were told “TRAIL OPEN” they started whooping and cowboy hollering and Penny became a circus horse … airs above ground, walking on her hind legs, spinning in place. Oh boy am I gonna have fun today. She watched all those horses go out down the road and never made a sound but twitched and shivered with anticipation. Naoma asked me if I had body armor to wear when I got on. I just stuck my tongue out at her. We have almost two hours until our out time. My thought process was to saddle them up about 7:45 am and hen walk around camp until all the horses left, THEN (and only then) get on. While we’re waiting, Penny is working off 10 of her 25 miles in her corral. 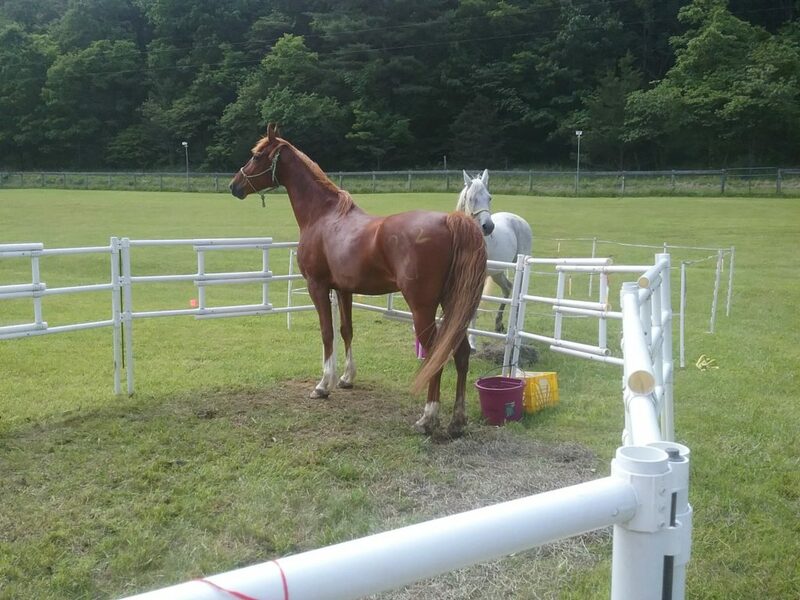 Thank goodness I have her in the corral, because if she was in hot wire, she’s be gone running all over camp by now. She body slammed that corral a dozen times trying to figure out if she could escape and follow that crowd of horses. Re-thinking my original plan, after I got her saddled, I put her on the mounting black and got on. 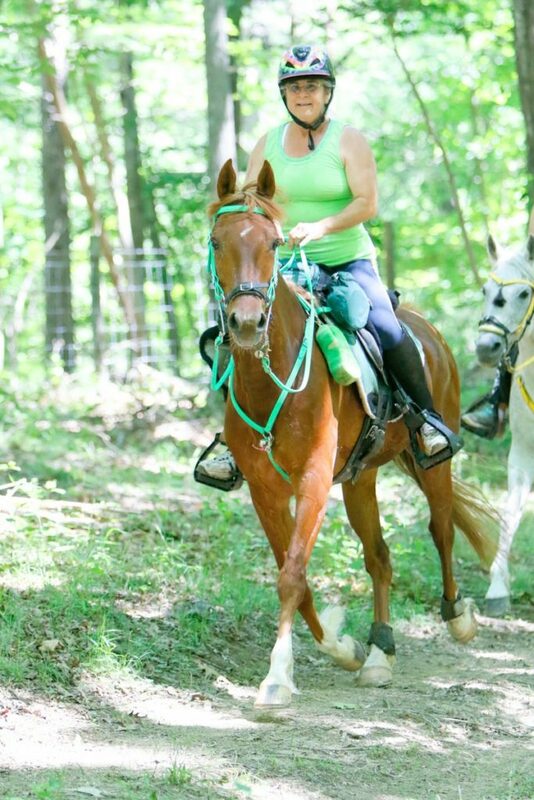 Naoma had just started walking Steel out of camp and she was like, “WTF Mom?” I quickly explained that if I was gonna get dumped, I wanted it to be in camp where people could save me and not out on the road where I would be lost in the jumble of riders going out on trail. Poor Naoma. I caught her off guard and she forgot her sponge. And she didn’t have time to adjust her girth or her stirrups before we got rolling. I immediately took Penny around camp, walking walking walking. Naoma just jumped on Steel and followed along. Okay, now my next plan was to walk out the upper road and wait until all horses were on trail so Penny didn’t get all excited. We met up with another rider with the same thought process. Unfortunately for her, her horse had a different opinion about walking away from that group of horses all huddled by the starting line and he was dragging her back back back. penny thought that was a great idea and was following him. I looked at my phone, which said it was “TRAIL OPEN” time, but as we rounded the bend, we saw that they had not called it yet. Just about when I was turning Penny back, they called it and the horses all took off down the road. And Penny is heavy in my hands. She has her back hollowed, head up, tail up, knees to her chest and hocks to her tailbone and we’re doing some pretty fancy high stepping. One fella caught it on video, he showed me after the ride. I hope he remembers to send me the link when he uploads it because Penny was beautiful (for a show ring). It’s one mile of dirt road to the trail. I have a death grip on Penny and I’m half-halting her every other step, and she’s still passing horse after horse after horse. She’s not giving me any behavior issues (like rearing or bucking) she’s just hell bent for leather to get in front of all these horses. How the hell did they ever show her in the ring? WOW! I quickly look over my shoulder to make sure Naoma is still with me and sure enough, Steel is rocking a huge extended trot and is right on Penny’s tail. We reach the turn onto the trail and we’re about mid-pack at this point. We started last and in one mile, we’re mid-pack. I get on by her and Penny rocks up to the next group of horses. (We are going uphill, pretty steeply, and Penny is just chugging along like hills are no big thing) They heard us coming (jingle bells were loudly proclaiming our arrival) and they got off trail to let us pass. Okay, there is some rockage going on here, not a lot, and maybe they wanted to take it easy. This is not working for Penny. She conditions in rocks worse than this and she’s prepared to move on out across it. It is single track trail with no where to get around them so I ask Naoma to squeeze on by me and take point so we have a bumper car in between Penny and the red ribboned tail in front of us. Penny was crowding and the more I asked her to back off, the stronger she got in my hands. (see the video) Pretty, stoic, calm Steel gets in front and Naoma backs her off that group of horses trailed by the kicker for about three horse lengths. Naoma keeps Steel in the position for about a mile and a half until there is a break in the trail that we can pass. Penny was crowding Steel the entire time and Steel did let her have it at one point, to which Penny responded by backing off about two inches. Penny quickly takes the lead again. I think Steel only got to be in the lead twice on the whole trail. We’re moving over the rocks and we quickly leave the four riders we just passed in the dust. Naoma has been pretty stoic and quiet herself so now that we’re in a “zone” and Penny does not feel the need for speed, I glance at my GPS and see we’re doing about 14.7 mpg through the laurels. Footing is pretty good here and she’s on a loose rein but I do back her down a bit. We have another 7 miles to go and she doesn’t need to burn it off already. “Really? we’re going that fast?” she sounds surprised. I turn around to look and see that Steel is in a nice extended trot and Naoma looks very relaxed. giggle – I didn’t tell Naoma. I have to get a helmet cam. Video on my phone is crazy and I have no idea how to edit it. And here we are. At the big long steep mountain trail, full of rocks and water run off ruts, and it’s long. I’m told it is 3.5 miles long. It never feels that long to me but this is what I’ve been waiting for. This should knock the stuffing right out of Penny and I want to be there when it happens. We’re going up and up and up and we pass two horses. And we’re still trotting some, walking more and going up and up and up. Penny does hesitate at one point and Steel (who has done this hill three times before) just keep on walking past her and Penny was like, “Oh no you don’t!” and trotted to get back in the lead. 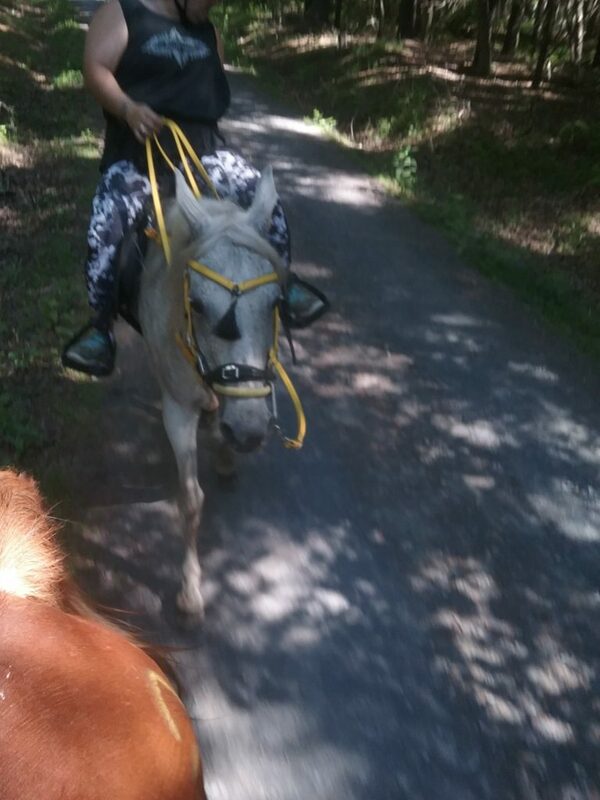 And we were doing a great trail ride, in our pocket with no horses in front and no horses behind. I hear Naoma sing out. “Do you want to stop?” I ask. “No, it’s not off, just slipped back.” she responds, so I look back and my-oh-my. I cannot see any pad in front of her saddle, and I know it was there when we left. She fiddling around with it, but without stopping to adjust, she’s never going to get it back into place. I did not “STOP TO THINK” that the next five miles is going to be downhill, on service road, and Penny will want to book it out. That pad is gonna end up on the side of the trail somewhere. And why yes, here we are. On the downhill service road. And Penny strikes out on her own. I watch my GPS speed. I turn around and Steel is very far behind us, trying to canter and Naoma is asking her to trot. I pick up the reins and slow Penny down. I swear to you, Penny asked, “But why?” … but she was a good girl and did as she was told. Steel caught up and Naoma’s face might have been a little pale. I asked her about it later and she said it was not. Naoma does not have hills or mountains where she is and she hasn’t ridden with me in a very long time so has no clue that I have become insane on my horse. We passed a couple riders going down the hill and I kept us to a maximum of 12 mph going (even though Penny protested occasionally, as long as we were in a pocket of no horses, she was respectful to my wishes.). Steel can maintain 12 mph pretty easily for short distances and I knew we were nearing the bottom. We did pose nicely for the photographer on this stretch of road, though. Down down we go to the slippery paved road we have to cross. Both my girls have drilltex on their shoes so I’m hoping I can keep Penny to a slow walk going across it. We are still in a pocket of no horses so she is very respectful of my desire to walk across the pavement. Once we’re on the other side, however, she quickly asks me to pick up the pace. I look to see if Naoma lost her saddle pad. I can still see i’s hanging in there and we’re about 2 miles from the hold, and most this trail is flat now, so I let Penny pick up the pace. We’re going and going and we cross a stream with two riders in it. I don’t stop, I use my newly learned “toss the sponge” skill and get two wets on Penny. Then we get to the stream that puts us in the field before the vet check. Steel drinks, and Steel grabs some grass, but Penny is like, “Hey, what’s going on over there?” so she only grabbed one mouthful of grass. I quickly throw grain into their buckets, add water and they both dig in. While they’re munching, we get them unsaddled. Into the vet for a check up. I did fuss at Naoma about leaving Penny (just for future reference) and Naoma was sad because she forgot. NO WORRIES! Let’s go let them eat! They both passed with all A’s. Penny dug in and ate all her grain, picked at her hay and then noticed that Steel had not finished her bucket. She politely asked, “Are you finished with that?” before she stuck her head into Steel’s bucket and ate all her grain, too. We had a nice shady spot so they ate and drank and were ready to go, right on time, we left the hold at 11:05. And now we’re on the yellow and black loop, 9.2 miles back to base camp and finish for us lowly 25 mile riders. I have to say, I am actually enjoying the “Luxury Distance” this year. I don’t know why, but it’s like playing instead of working. Not sure how I’m going to feel next year when I bump us up to the 50’s. I have to complain here a bit. The yellow and black trail was not as nicely marked as the blue and white trail we came in on. There were two turns where there was no confidence marker around the turn. In fact, at one point we went half a mile up trail, didn’t see any black and yellow markers so came back down trail. We met two riders as we came back out trying to figure if we were on the correct trail or not. That made me sad because Penny had been working very well in her pocket of no horses and now she was “ON” and getting bully. We went back up the trail and the first black and yellow marker we saw was exactly .71 miles up that trail. If we had simply continued on another couple hundred feet we would have saw it and could have kept our pocket. Then, not too much further down the trail, we came to another spot where the trail said a black and yellow turn was coming up but there was not confidence marker around the turn. Every the two ladies in front of us were concerned. That next marker was .48 miles from the turn. And then, we’re on the downhill back into camp. I was thinking we must have missed something because that seemed too fast. I look at my phone and we’ve only been on trail for 45 minutes. We’re about two miles from the finish line. WOWZA. I never felt like we were moving that fast. Penny is so stable and smooth. And here we are, crossing the finish line. Now, let me explain. In the LD (Limited Distance) division of endurance, a horse down not “finish” until it has met the pulse criteria. Which is 60. The finish line is more to record our crossing the line time and now we have 30 minutes to get pulsed in. So, a horse coming in after us, who pulses in before us, will have a higher placing. I pull Penny’s girth and look at Steel, her girth is already hanging an inch under her belly so no need to loosen it (chuckle) Poor Naoma, she had a ton of technical difficulties on this ride. 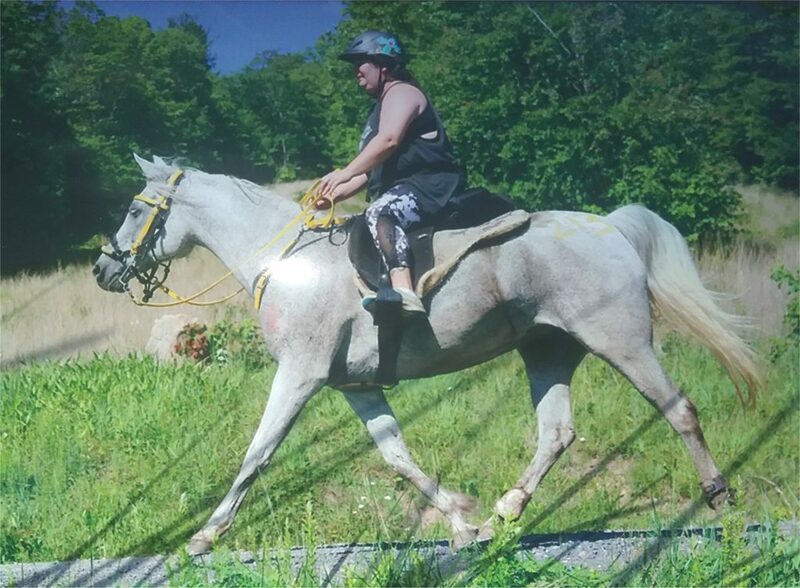 First her stirrups not being the correct length, forgetting her sponge, almost losing her saddle pad, girth never snug enough, … I hope she survives all this. Penny is at like 68 so we sponge and sponge and sponge while Naoma goes to pulse. Naoma and Steel are pulsed in at 9th place. THANK YOU MARY COLEMAN FOR SENDING MY CHILD TO THE PULSER!!!! Penny pulses in at 12th place. Wow, amazing. 46 horses started this 25 mile competition and we started behind most of them. Over to the vet for trot out and check over. You aren’t finished until the vets say you are. I don’t have their cards so I don’t know exactly, but I do know Art told me that Penny had straight A’s and he felt she was ready to move on to 50’s. OH NO …. She has no brain yet, she can just keep on doing the 25’s this year until she “gains some brains”. And then we go back to our camp and dump stuff so we can go help Cindy at Bird Haven. We rush up there, just to see Cindy leaving Bird haven on her last 6 miles of the 50 mile ride. She’s running out front with two other riders. I can’t believe it. This is so exciting for her and Bailey. We gather up our hold stuff, which isn’t that much because I try to travel light to away holds, and back to camp we go. We no sooner have all our stuff unpacked than here comes the three front runners. remember, we are camped right behind the Start/Finish line so we got to see all the action. Cindy came in 2nd on Bailey. On any other distance (50, 75, 100) when you cross the finish line, that is where you placed. And now Cindy has finally beat OD (The Beast Of The East) and did it in second place.